Every donation to Breast Cancer Action is an investment in health justice for all women at risk of and living with breast cancer, and an important form of grassroots activism. 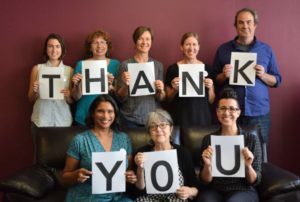 We’re grateful to have so many people all across the country who raise money in their communities for our work each and every month. We call them our 3rd Party Fundraisers, and they’re amazing. This group of activists spreads the word about our work, grows our community, amplifies our voices, and raises the funds we need. Whether they’re launching a fundraiser on Facebook, promoting a hike or a run using our Don’t Pink for Me page, or hosting a house party, this awesome group of people helps power our work. We deeply appreciate the support and generosity of our 3rd Party Fundraisers. In honor of their commitment to our mission and our work we want to share why, in their own words, a few of them raise money for Breast Cancer Action. I raise money for Breast Cancer Action because….